Researchers have discovered a new species of dinosaur that lived about 100 million years ago and may have weighed as much as several elephants. The dinosaur, named Rukwatitan bisepultus, was a titanosaurian, a member of the large-bodied sauropods that thrived during the final period of the dinosaur age. The scientists unearthed the fossil in Tanzania, which makes it one of the few titanosaurian specimens recovered in Africa. Most other known examples have come from other regions, especially South America. The scientists first saw the fossils embedded in a cliff wall in the Rukwa Rift Basin of southwestern Tanzania. With the help of professional excavators and coal miners, the researchers unearthed vertebrae, ribs, limbs and pelvic bones over the course of two field seasons. After performing CT scans of the remains, the investigators determined that the animal was different than other dinosaurs identified before, including those previously discovered in other parts of Africa. 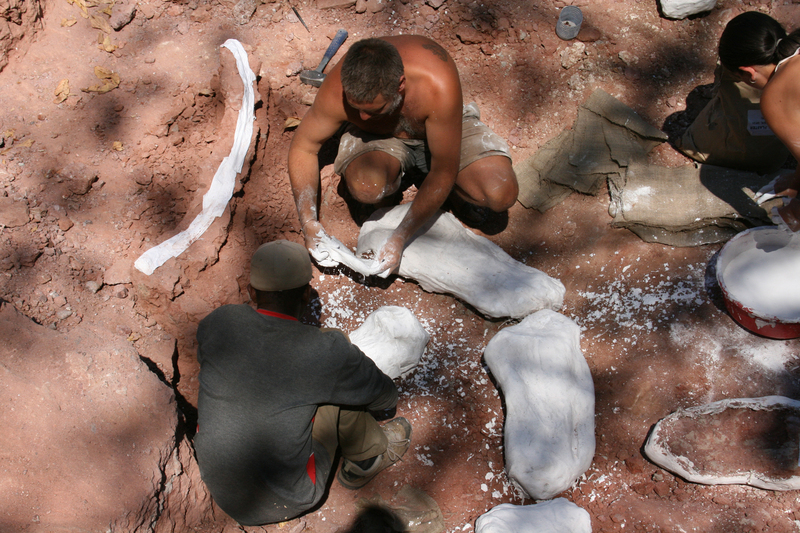 "Using both traditional and new computational approaches, we were able to place the new species within the family tree of sauropod dinosaurs and determine both its uniqueness as a species and to delineate others species with which it is most closely related," study author Eric Gorscak, a doctoral student in biological sciences at Ohio University, said in a statement. Titanosaurian sauropods were huge herbivorous (plant-eating) dinosaurs with characteristic long necks. Although Rukwatitan was not among the largest of titanosaurians, the investigators estimate that the animal's front legs were about six feet long and that it may have weighed as much as several elephants. A silhouette of the dinosaur indicating which bones have been found. The horizontal line equals one meter in length. Gorschak et. al. The researchers noted certain similarities between the newly-discovered dinosaur and another titanosaurian, Malawisaurus dixeyi, previously found in Malawi. Still, the two dinosaurs are distinctly different from each other, and from other titanosaurians known from northern Africa, according to study author Patrick O'Connor, a professor of anatomy in the Ohio University Heritage College of Osteopathic Medicine. Thanks to the new discovery, scientists can now learn more about titanosaurians. So far, the fossils of only four titanosaurians have been found in Africa, compared with more than 30 in South America -- including a humongous specimen unveiled last week, which is believed to be the largest land animal ever found. "Much of what we know regarding titanosaurian evolutionary history stems from numerous discoveries in South America -- a continent that underwent a steady separation from Africa during the first half of the Cretaceous Period," Gorscak said. "With the discovery of Rukwatitan and study of the material in nearby Malawi, we are beginning to fill a significant gap from a large part of the world." The study describing the discovery was published Monday in the Journal of Vertebrate Paleontology.